Capital Gate is a skyscraper in Abu Dhabi adjacent to the Abu Dhabi National Exhibition Centre designed with a striking lean. At 160 m (520 ft) and 35 stories, it is one of the tallest buildings in the city and features an 18-degree incline to the west. 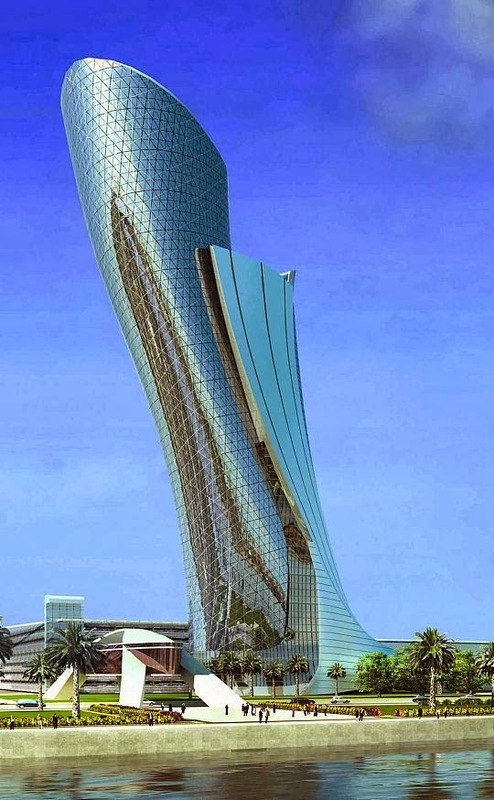 The owner and developer of Capital Gate is Abu Dhabi National Exhibitions Company. The tower (also known as the Leaning Tower of Abu Dhabi) is the focal point of the Capital Center/Abu Dhabi National Exhibition Centre master development. The building has a diagrid especially designed to absorb and channel the forces created by wind and seismic pressure, as well as the gradient of Capital Gate. Capital Gate is thought to be the Middle East's first building to use a diagrid; others around the world include London's 30 St Mary Axe (Gherkin), New York's Hearst Tower and Beijing's National Stadium.